The mission of the Avon Grove Instrumental Music Boosters Association (AGIMBA) is to actively support the work of the Music Department Directors and Music Department Students by committing time, talent, and financial support for the betterment of the Avon Grove High School Music Programs. 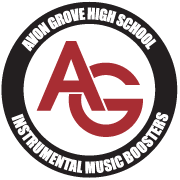 As a parent or legal guardian of an Avon Grove High School Music Department Student you are automatically an Avon Grove Music Boosters Member. Everyone is encouraged and welcome to attend the Booster Meetings which are held at 7:00pm on the second Monday of each month. The Boosters typically meet in the Avon Grove High School Band Room but times and location within the school may vary. Please subscribe below to be included on our mailing list for updates and information about AGIMBA. ​Tell us a little about your Student and provide your information to receive periodic emails from Music Boosters, intended to keep you informed and connected. Thank you.